It can be hard to imagine how new construction will alter an existing view. Our visual designers provide knowledgeable, high-level drafting and design in support of CEQA/NEPA technical studies, reports, and engineering plans to help decision-makers and stakeholders visualize projects prior to expensive building investments. Our visual artists and designers use complete before-and-after photo simulations, 3D renderings, architectural walkthroughs, and engineering fly-bys for commercial, residential and public infrastructure projects. We have extensive experience reading and understanding civil, architectural, mechanical, structural, roadway, and grading design to inform visual simulations. Our team are also experienced at presenting to city council members, planning commissions, and community members, educating them so they understand a proposed project’s appearance, how it will impact surrounding sites, how simulations were done, and the accuracy of the project depiction. 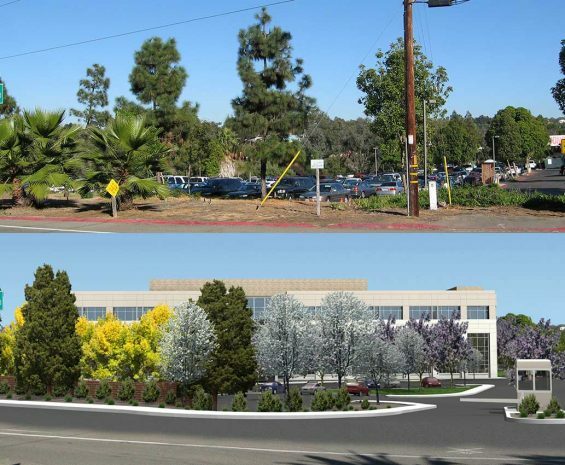 To accommodate population growth, the City of Encinitas undertook a five-phase expansion to more than double the square footage of hospital facilities.